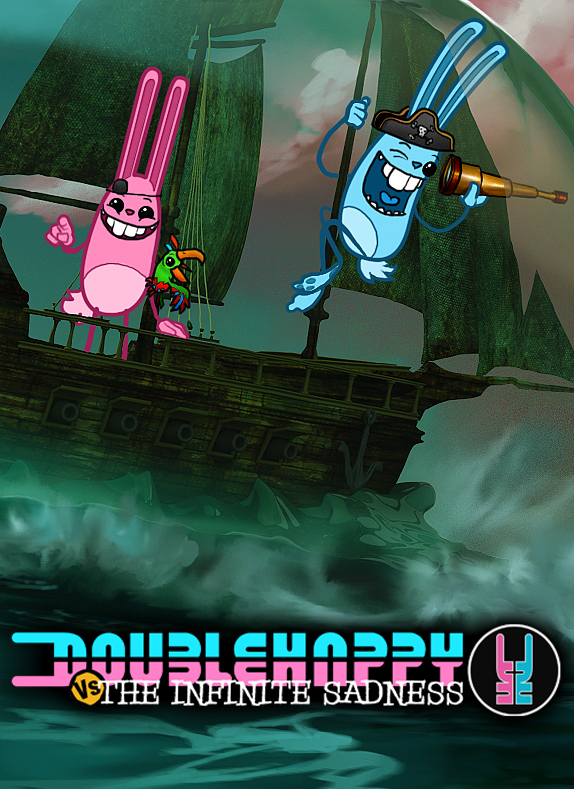 Set forth on an epic journey with Double Happy - a pair of neo-pop edgy cute rabbits to overcome the entropic, all consuming power of the Infinite Sadness. Challenge both your brain and your reflexes as you solve puzzles and complete action mini-games, unraveling the secrets of the Isles of the Ancients and discovering the corruption plaguing the lands. 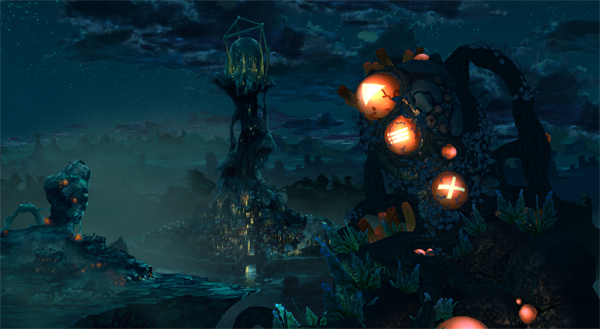 The games take cues from other quirky comedic games such as Oddworld, Neverhood and Machinarium, creating a unique and contemporary spin on the old point and click adventure, with piques of trigger response action peppered throughout. In a game design twist, we’re extending an invitation to the community to conceptualize features of the game world through multiple creative competitions, giving artists an opportunity to have their designs featured throughout the game world. We've been nominated, TWICE, in this year's South Australian Screen Awards! 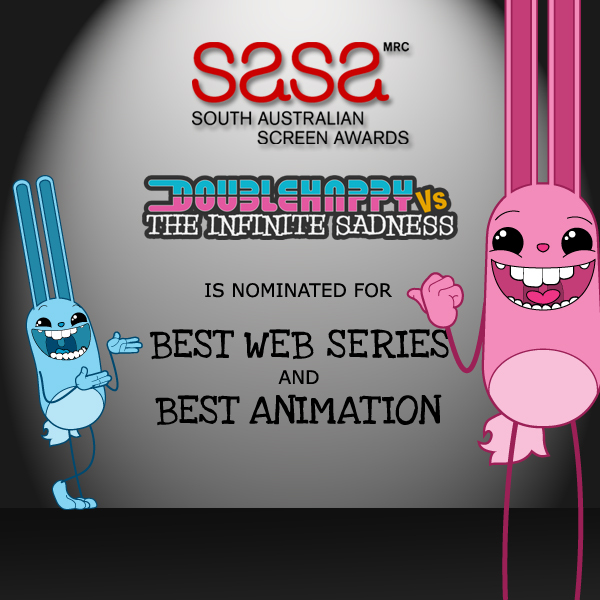 The judges have put us forward for Best Web Series and Best Animation which is really awesome! Winners are announced on May 16th, so we'll keep you posted. If you haven't checked our webisodes out yet, you can do so on our YouTube channel! In other news, we're still working hard on our EPOC; our proof of concept for game play in the Double Happy Universe. Here's a shot of our menu buttons in their glowing glory! And here's how the menu looks as a whole, sans text. There were a few motives here; we'd like to say the only reason there isn't any text is to make it multilingual, but you know...pretty pictures! Can you tell what each of the buttons do? We've also still been working on our cinematics - previously we've shared a frame from one of them (you can check it out HERE!) but with any sort of luck we're just about finished with the two made so far. They have been a long time in the making, but looking at them now it has definitely been worth it. What considerations did you make in creating your menu? Any favourite game menus to share? Great shorts, I hope you'll be able to keep the same energy with the game. The webisodes are designed to give everyone a good idea of Pink and Blue's character - so it's really great to hear you're picking up on the energy. I hope the game comes out soon. Will it all be in 3d or 2d? The game is 3D, but with some 2D styled elements. We're working on a gameplay trailer to really show it all off - our Facebook and Twitter accounts (as well as here on Indie DB!) will be the best ways to keep up to date.